A thread all about dancing! Just kidding! This is a thread about the team Quickstep, if anyone wants to start a thread about the dance they're free to do so. So, Quickstep; gotta say they're doing pretty well recently. Last edited by RedheadDane on 03 Jan 2019 10:00, edited 1 time in total. 11 wins aleady in 2018. Mostly "**** small races" but still pretty impressive! The Day Team Sky disappears from cycling I'll truly enjoy watching a mountainous Grand Tour stage again -- former Milan-San Remo winner I interviewed. Gewiss-Ballan ain't got **** on them. Ah, a thread for the team winning the team victory ranking since 2012. I doubt they'll keep it going this year. 2018 will be an important year for them with Boonen, Kittel, Martin, Brambilla, Trentin and De La Cruz leaving the team. They may have lost the best sprinter in the world but they still have the two best lead out men in the peloton. Viviani seems to be a nice fit though. Alaphilippe is the only leader for the Ardennes this year, I hope he finally gets his win this year. He's such a great guy. They had the same: 10 victories. Arguably, their overall results have been better so far than last year. Breh wrote: Ah, a thread for the team winning the team victory ranking since 2012. I doubt they'll keep it going this year. In all fairness, it's not like Brambilla, De la Cruz nor Boonen for that matter had much, if any, impact on their winning tally last year. I'd say they're still doing pretty fine without Boonen. Akuryo wrote: 11 wins aleady in 2018. Mostly "**** small races" but still pretty impressive! Hard to win anything else when there hasn't been a single remotely important race yet this year. It's February 10th! Sure but those Gaviria wins are a bit... cheap... I don't know how to say it otherwise but you know what I mean. Same for the Degenkolb wins in Mallorca. Gilbert apparently attacked with 60k to go in Vuelta a Murcia. Training for Milano-Sanremo and #striveforfive? He is becoming more know for his marathon rides rather than his uphill sprints. Is he going to do the same thing in MSR? That's the only way he can win it. I think he is too old to go with Sagan on Poggio, it's Alaphilippe's job. And in the sprint, they both have Gaviria and Viviani. Velolover2 wrote: Gilbert apparently attacked with 60k to go in Vuelta a Murcia. Training for Milano-Sanremo and #striveforfive? There was a big morning break of 40, Gilbert attacked from that with Trentin, Sierry, Jungels. On Collado Bermejo Gilbert and Jungels dropped the others and Valverde, Sanchez and Fuglsang attacked from the peloton then after the climb catched and dropped the Quickstep duo. Teams loses "big-name" riders all the time. Some teams might suffer a drastic decline in results when that happens, Quickstep isn't one of those teams. Whose baby is he holding? 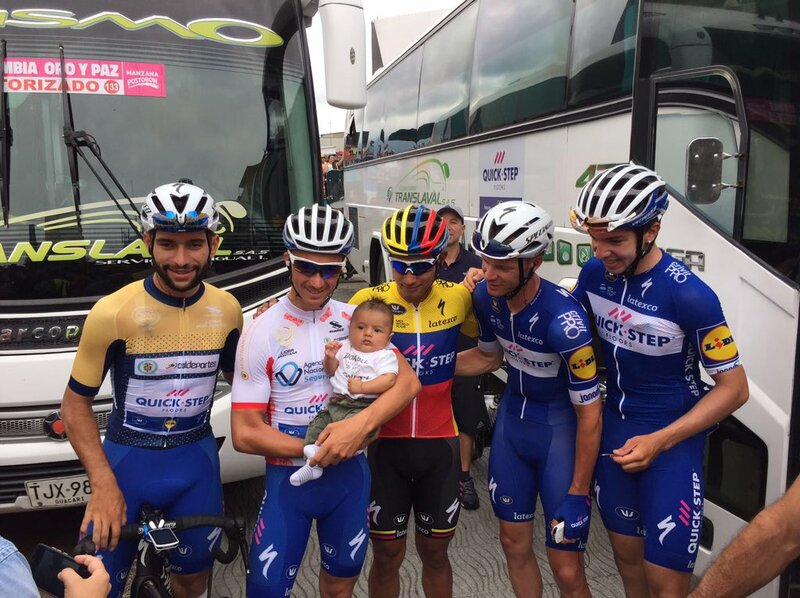 Alaphilippe's holding Gaviria's nephew, I think the baby is Gaviria's sister son. They are definitely off to a nice start. A win is a win regardless of where you get it. They all count as wins in your final win tally. MSR and Paris-Roubiax are the two monuments missing from Gilbert's palmares to get all 5. Although I think he said he was targeting Paris-Roubiax this year, but I do expect him to be at MSR as well. As for too old, well he is younger than Valverde.